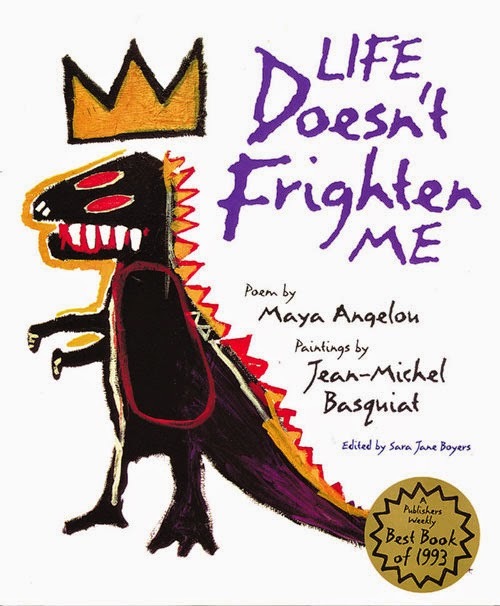 Just bought this children book with the great message: "Life Doesn't Frighten Me"
I love children books and my favorite artists have made children books. But don’t ask me to teach children about contemporary art. They are so open and imaginative that it makes me quite insecure. I tried a few times at the museum, but without my back-up of theory and history I have no clue how to go about and I only manage to come up with one question: “What do you see?” Luckily, this question mostly does it because children’s imagination runs wild easily even in front of a Barnett Newman. Teenagers can be more tricky because they seem to have lost the willingness to go along. My neighbor Hannegret teaches art at high school and knows all about it. Having breakfast together the other day, she told me she had to change her idealistic endeavors of learning her kids how to come up with their own interpretations and associations. They rather prefer being told the “facts” so they learn those by heart in order to get a good grade. But I could sense that Hannegret is one those teachers who doesn’t give up easily on idealism, so I pushed her a little more. And I discovered she’s basically like a Valeska Gert dancing the Pause in the 1920s or a John Cage bringing silence into music, yet she does so in teaching. During every practice she asks the kids to remain silent for 10 minutes. If they succeed they get a +1, if not a -1 (without the grades, nothing works in high school). This way they work in silence, hopefully get the benefit out of it in their daily noisy high school environment, and maybe even get into the flow of making art. Even at the age of 14, Hannegret told me that she has to start with teaching the basics, like learning how to hold a pencil correctly and how not to crack the paper. So in art class she’s teaching the students basic tools for life, like attention, organisation, and carefulness. Hannegret is also quite avant-garde because instead of going with the contemporary art trend of “the more the material the better”, she asks her students to take a paper that would normally be thrown away. Then they have to look at this paper as something with its own particular identity marked with stains and cracks, and ask what it says and to work with that. This exercise results in the most wonderful drawings. Or Hannegret makes them fill the paper with small boxes of 2x2 cm. Then she asks her kids to imagine they are left all alone in the world and they have to fill these boxes with stuff they want to have in that world. Pizza appears and TV is a must. But one student started out with drawing a DIXI toilet in the first box and then a concert stage in the second one. A concert always starts with a DIXI toilet, he said. And that's a Marcel Duchamp right there.